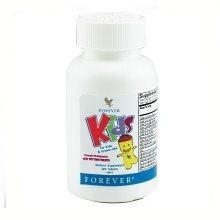 Forever Kids Chewable Multivitamins is chewable tablets with all the nutrients your kids need each and every day. These fun and delicious multivitamins provide both adults and growing kids ages two and older with the vital vitamins, minerals, iron and phytonutrients they may be lacking. Phytonutrient base taken from the finest raw foods including broccoli, spinach, beets, and carrots. Iron , a commonly deficient nutrient, is a new addition to Forever Kids Multivitamins for its role in immune support and cognitive development, while it also supports overall health. Phytonutrients are highly desirable plant nutrients found in vegetables and fruits. Our new and improved formula has more phytonutrients from a new, improved blend of fruits and vegetables. Formulated without artificial colors or preservatives, the phytonutrient base is taken from such nutritious foods as carrots, beets, broccoli, spinach, blueberries, apples, cranberries, tomatoes and strawberries. The result is a multivitamin that tastes great, is fun to eat and complements the range of other supplements that Forever Living Products offers. For children two to four years old, take two tablets Forever Kids Multivitamins per day under adult supervision. For children over four and adults, take four tablets daily as a dietary supplement. Warning: Accidental overdose of iron-containing products is a leading of fatal poisoning in children under 6 years of age. Keep this product out of reach of children. In case of accidental overdose, call a doctor or poison center immediately.